Spectre bolt-on universal exhaust tips are a great cosmetic addition to your exhaust system, featuring a long lasting polished stainless steel finish. Designed to fit 2 inch to 3 inch exhaust tubing, this tip has a classic flat pencil style end with a 4 inch outside diameter body. 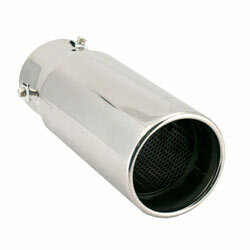 This exhaust tip easily bolts on using the 3 included mounting screws, or can be tack welded into place. Solid build. Looks great, easy to install. I would shop here again.